Mindgrub, a leading technical agency and creative consultancy, is proud to announce the hiring of Baltimore native Sean Mulcahy as their new Head of Business Development. Sean’s strong working knowledge of the marketing technology ecosystem and his experience working with client teams to develop cutting-edge strategic solutions make him an exceptionally great fit here at Mindgrub. 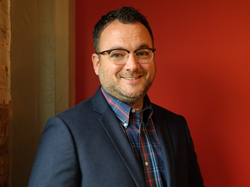 Mindgrub, a leading technical agency and creative consultancy, is proud to announce the hiring of Baltimore native Sean Mulcahy as their new Head of Business Development. Sean has over a decade of experience in digital strategy and sales, and will work closely with Mindgrub’s Digital Marketing division to expand the team’s impact. Sean Mulcahy, a graduate of Washington College in Chestertown, MD, has previously held a Sales Director position at Vocus and is the former Vice President of Business Development at Jellyfish Online Marketing US. About Mindgrub | Mindgrub, a member of the Inc. 5000 for five years running, a Baltimore Magazine Best Place to Work, and the Maryland Tech Council’s Tech Company of the Year, is an agency at the intersection of technology and business, designing and engineering solutions that define a company’s digital presence. Mindgrub is a pioneer in the development of mobile applications, websites, mobile games, video and multimedia content, enterprise information systems, location-based services, digital and traditional marketing programs, augmented and virtual reality initiatives, robotics projects, and more. Mindgrub has received two gold ADDY Awards for Best Mobile App, the American Marketing Association’s awards for Best Overall Marketing Campaign and Best Branding Campaign, the Baltimore Business Journal’s Big Buzz Award for Best Mobile App, MTC’s Emerging Technology Company of the Year, Technical.ly’s Design Development Firm of the Year, and was one of Inc.’s Best Workplaces of 2017. Mindgrub’s work has been featured at conferences such as SXSW, Adobe Max, and SALT, and has been profiled in The Huffington Post, CNN, and Newsweek. Headquartered in Baltimore, Mindgrub has offices in New York City, Philadelphia, and Washington D.C. Connect with Mindgrub online at http://www.mindgrub.com.